Project Help is a program administered by your local Project Help board to help others who are less fortunate pay their electric bills. 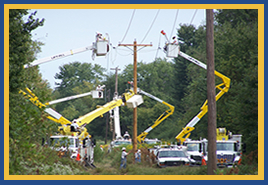 Carroll County Electric Department collects donations from our customers and remits them monthly to the Project Help board. The board certifies the eligibility of the recipient and disburses the funds. All donations go directly toward helping handicapped, low income and elderly residential customers. If you would like to participate in Project Help please call the office for details or Click here for application.